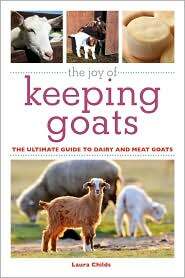 The title of this book had me at first glance as I do find much joy in keeping my goats! It is the ultimate guide to dairy and meat goats, and a joy to read. Firstly the pictures are beautiful snapshots of goats. I had to thumb through before even reading it to see all the great goat pictures! Very pleasing to the eye, and not at all just a manual you keep tucked away on a shelf. She starts of for the very beginner with ‘goat speak’, terms which you should know when looking into goat herding. Even ways to tell the difference between a sheep and a goat, even us experienced goat herders confuse that at times in those rare breeds! Laura Childs begins her book with reasons one may consider having a goat farm. From being lactose intolerant, to wanting weed eaters, to just enjoying the antics of goats. Each person will have a variety of reasons for finding joy in the goat. I love how she describes each breed of goat from dairy, fiber and the meat varieties. She then goes on to teach about different types of shelters and feeders that you can make and put together for your goats. Tips on feeding, information on your goats health, and even a list of poisonous plants you should remove from your pasture. When to breed, how to breed, and tips on kidding. Raising the kids and caring for their horns and castration if being wethered. Laura Childs completes the book with ideas on milking, working with fiber, and processing goat meat. She includes recipes that sounds delectable. She definitely comes full circle for the beginner. A comprehensive book for the beginning goat herder and basics that even the seasoned veteran needs to reference from time to time. Beautifully done!